A High End Resale Designer store and designer boutique with luxury brands and collectible fashion and clothing by Natasha Young in Las Vegas with name brands like Chanel, Louis Vuitton, Prada, Hermes, Gucci, Valentino, Cavalli, Pucci, and Louboutin. The art of fashion is expressed by what we wear. My passion is to inspire and nurture the fashion diva in all of us. High fashion can be shared with everyone, if we are lucky enough to have exclusive access to our friends closets. 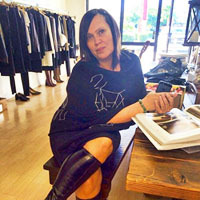 My idea for my new store, Closet Couture, evolved from my own love of fashion and the art world. You will find vintage pieces from top designers that you can borrow or take home for your own. Chanel, Prada, Gucci, and Cavalli are among the many designers available at Closet Couture. Finally, there is a place where you can mingle in a lounge atmosphere, surrounded by art on the walls and art to wear and accessorize, all at real world prices. If you have the passion for fashion, this is the place for you. Allow me to inspire you! Come discover the weekly new arrivals!